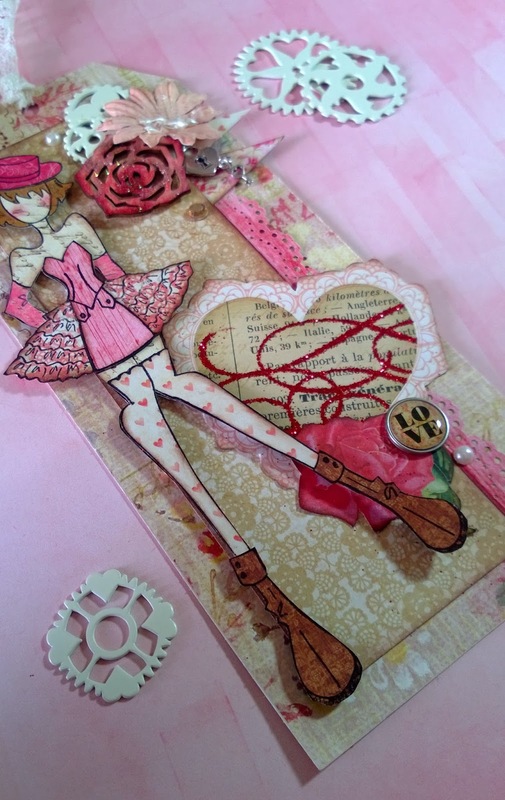 Julie Nutting Designs: Tag of the Month....HaPpY VaLenTinE DaY! Tag of the Month....HaPpY VaLenTinE DaY! I thought it would be fun to do a tag of the month. 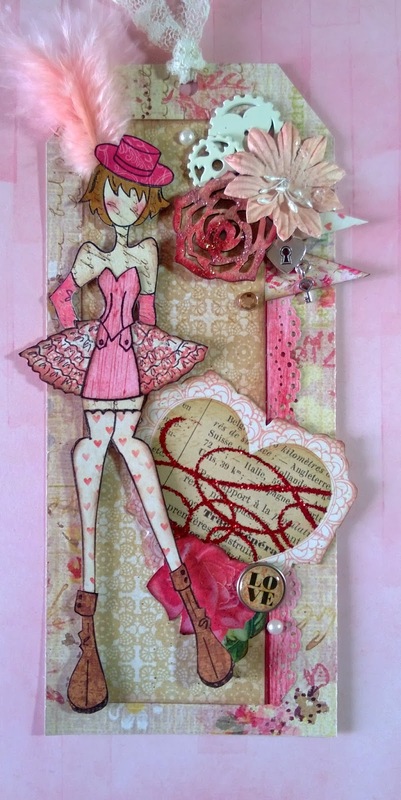 Not an in depth technique type tag but just an eye candy, fun, playful paper doll tag of the month. Because that's just what I do...fun, cute, pretty colors. Yes, I know, I missed January! January was a busy month, filled with making samples for CHA, scheduling classes, ordering supplies and starting the class samples. With all that behind me, I am more than ready for some fun! This is my newly released stamp "Pricilla" hitting the stores as we speak. I have to admit, she was not my favorite stamp and now that I have had a chance to work with it I love her! Her ruffles, leggings and hat are so much fun to play with. She's a bit steampunk and I know we usually think of the dark, grungy colors when we think steampunk. I decided to lighten her up a bit for Valentines Day. I love the feminine look of pink and brown with lace and ruffles...who doesn't? I dug into my paper stash and found the perfect paper for the tag itself...a gorgeous paper from the Prima Fairy Rhymes collection designed by Jodie Lee. It went perfectly with a Valentine paper collection by My Mind's Eye that I fell in love with. The tiny metal lock and key is new product of mine that comes with crowns and handbags that fit perfectly with my stamps. When I make my tags, I simply just start pulling beautiful paper combinations together and start cutting! I then pull any embellishments that I know will fit perfectly with my theme. I then just move things around until I am happy with the composition and start gluing. It's just that simple! My Mind's Eye Record It collection...sorry, I chopped off the numbers, but it's in all the stores now. This is used for the background, her dress and the cut out heart. I love her! She's fabulous. Great idea to do one for every month, Julie. I've been making one for every holiday. I just adore all of the dolls and can't wait to get the new ones I ordered. Julie: Love how you used your new Priscilla stamp. I just got back from buying her ... plus Betty, Becky, Megan, Mindy, Aurora, SeaSallie, Little Girl w/Toy, and Party Girl. The dies weren't available but those are next. I also bought a Tag Pad in the beautiful Hancock Park patterns ... LUV all things Julie Nutting! Great tag. Love the stockings! I love this girl and combined her with one of your other girls to create a flamenco dancer. Just love playing with them all. LOVE IT!! Great use of papers and the background is prefect! Four of my friends are going on the cruise with you... Hope you do another one in the future. Would love to tag along! Thanks for the eye candy! I absolutely adore the Nutting girls, and I am so glad that my family of dolls will soon be growing larger. I plan on having lots of fun with this steampunk cutie, and the new Cowgirl doll stamp. Also, I hope to be able to add some of the cutting dies to my collection (I love the hair dies the most). Thanks so much Julie for sharing your creative talent with us!!! Love your Doll Stamps! I can not wait to get the new ones! I have started doing this too. I started last October and have made one a month since then. So much fun! Love this doll stamp. My niece is Priscilla and Oamaru NZ is the HQ of steampunk in our Victorian precinct. So a must for me when it is available in NZ. Love this stamp. My niece is Priscilla and Oamaru NZ, is HQ of steampunk in the Victorian Precinct. So this stamp is a must for me. Can't wait for it to reach NZ.